Adult acne can be quite embarrassing and it makes us self-conscious in social gatherings. Hence, we are often willing to do anything to get rid of these facial blemishes. Men in general are a lot more willing to try pills gotten online or recommended by their dermatologists without reviewing the risk factors. This is because while a woman can hide her acne behind foundation and makeup, most men are unwilling to do this as they see makeup as the feminine. Accutane the most commonly recommended drug by dermatologists to treat acne was pulled off the market due to adverse side effects and is a subject of Class action Suite (click here to learn more). However, other generic forms of Isotretinoin are still available and being prescribed by dermatologists. Interestingly, in the USA only the “innovator” ( the one that actually developed the drug) can be suited for its detrimental effects. Even they remain exactly the same as the original drug. The possible side effects of Isotretinoin can be classified into two categories; rare and common (here the side effects are usually mucocutaneous related). Although there common symptoms can usually be managed or eliminated by reducing the dosage, some of the rarer side effects are life-long and extremely dangerous. Night blindness: It affects the eyes and induces night blindness or poor vision in low light in some people. High tone deafness: It also has been shown to affect some of your ear functions and induce tone deafness. Mood changes: Mood swings have been noted as one of the side effects. Hyper aggression in young men: Isotretinoin has been noted to induce aggression in some young men. Depression: Depression has also been reported and is one of the side effects doctors watch for as this might lead to suicidal tendencies. Achilles tendonitis: There have been some reports that isotretinoin makes some patients prone to Achilles injuries. Acne Fulminans: Is one of the worst forms of acne and is usually very painful. It appears as an open sore (ulcerating) after hemorrhaging and can cause bone lesions and abnormalities in lab tests. Pyogenic Granulomas: These are small lumps on the skin that form. They are usually blood red and bleed profusely as they contain blood vessels. Fragility skin: Susceptible to easy breakage and injury. Epidermal atrophy: Here the skin develops a depressed look because of thinning / reduction of the dermis. Cheilitis: Inflammation or dryness of skin around the mouth and lip. Facial erythema: Redness of the face (the usual reaction or color when embarrassed or excited). This occurs because there is an increase in blood flow to the facial skin due to dilation of blood vessels. Itching: Itchy skin has also been reported as one of the side effect. Conjunctivitis/ Blepharitis: This is what is more commonly known as pink eye. It is the inflammation of the outer membrane of the eye. Women that are planning on becoming pregnant, or pregnant are not allowed to take isotretinoin because of this side effect. In fact, before isotretinoin is prescribed to a woman she must first confirm she is on some kind of birth control. So what is teratogenicity? 50% of all women who become pregnant while on Isotretinoin will spontaneously abort, while the other 50% will be give birth to children with congenital defects and abnormalities. Teratogenicity is the defined as the capability to produce congenital defects. Children born while their mothers are on Isotretinoin are usually born with skeletal and cardiovascular abnormalities. As a result, this drug is not a good option for young women and mothers. It has been observed that those on isotretinoin have elevations in their liver and lipids tests. The test numbers usually return to pre-treatment levels almost immediately after the drug has been stopped. People who have diabetes, families with histories of liver issues or other liver complications are watched closely and tested continuously. You should note that though a good portion of the possible complications has been mentioned here, this list is not comprehensive and there are still other complications arising from the use of isotretinoin. 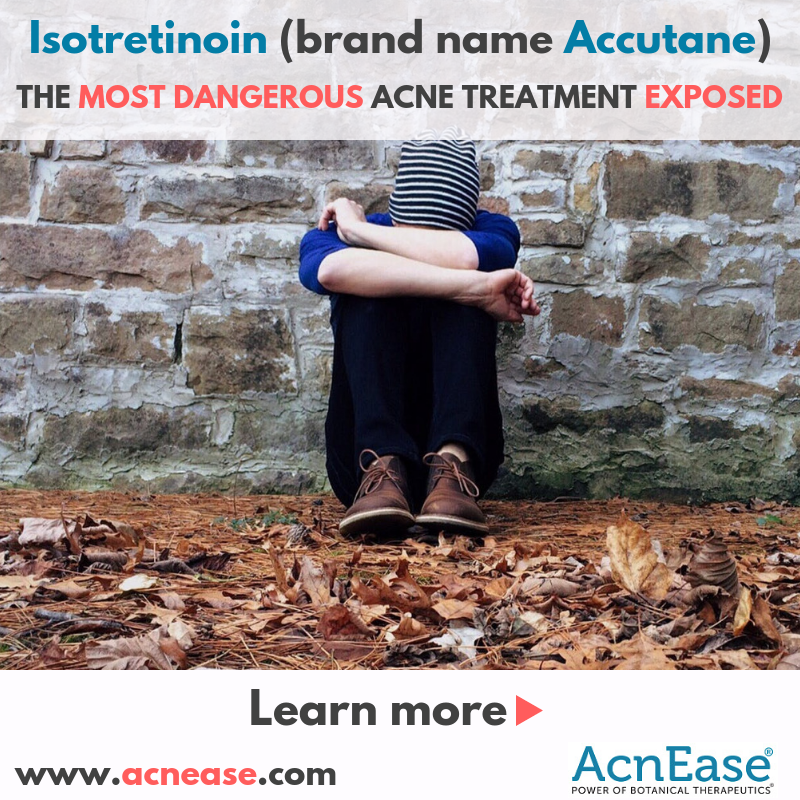 Moreover, those who use isotretinoin have complained about the return of their chronic acne once they stopped taking it. So is there really a different and better way? Yes there is! Why risk your health or the wellbeing of your child when there is a better non-toxic alternative out there. 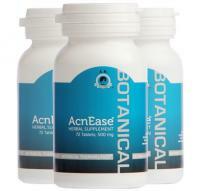 AcnEase is an acne herbal treatment that is made with only natural ingredients and is completely safe to use. This therapy was formulated by a team of medical professional, and has a proven record of effectively treating chronic acne in more than 96% of people who try it. Those suffering from acute or chronic acne should seriously consider attacking the problem at its source. AcnEase is a brand that created natural botanical therapeutic that works to regulate your internal balance and moderate impact of hormones (major culprit behind acne formation) on your sebaceous gland. This is therefore the ONLY products that does not simply get rid of symptoms of acne (pimples, cysts, blackheads and white heads) but also PREVENT new acne from forming , This effectively eliminates the acne problem before it even has a chance to develop. Click here to choose the best treatment for your acne type.